Just a stones throw from Darling Harbour, in the fascinating Chinatown precinct, Oaks Harmony offers Sydney accommodation only a stroll from the CBD and all that Sydney offers. Surrounded by some of Sydney's best restaurants, department stores and close to theatres and the Queen Victoria Building, Oaks Harmony offers superbly appointed one and two bedroom fully self-contained apartments. The majority of the rooms offer split levels, with balconies, as well as full kitchen and laundry facilities. Hotel amenities include a 20m indoor, heated swimming pool, spa, sauna, professionally equipped gym and games room. Spacious 1 Bedroom apartment with full kitchen facilities. Apartments offer TV, DVD, mini Stereo & CD player. The room caters for a maximum of 3 adults, and a maximum of 2 children but cannot exceed 3 guests in total. Rates are for 2 guests. Extra adults $37.00 per night. Extra children $37.00 per night. Spacious 2 Bedroom apartment with full kitchen facilities. Apartments offer TV, DVD, mini Stereo & CD player. Some apartments have split levels. Rates are for 4 guests. Self Contained Apartment with kitchenette, bathroom and full laundry facilities. The room caters for a maximum of 2 adults, and a maximum of 1 child but cannot exceed 2 guests in total. Rates are for 2 guests. 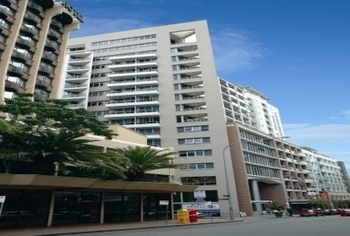 Harmony Apartments are located at 107 Quay Street. Quay Street is located directly across the road from central Station. Harmony is located near the corner of Quay Street and George Street. An oasis from the bustling cityscape, the hotel also boasts a lawn and garden area which travellers, both leisure and business, appreciate for its green and tranquil nature.